HAPPY SUNDAY FRIENDS! I’m beginning to LOVE Sundays again. There was a long time where I dreaded them, so it feels good! Here I am in the GORGEOUS ZION NATIONAL PARK, in Southern Utah. I spent some time there last week. 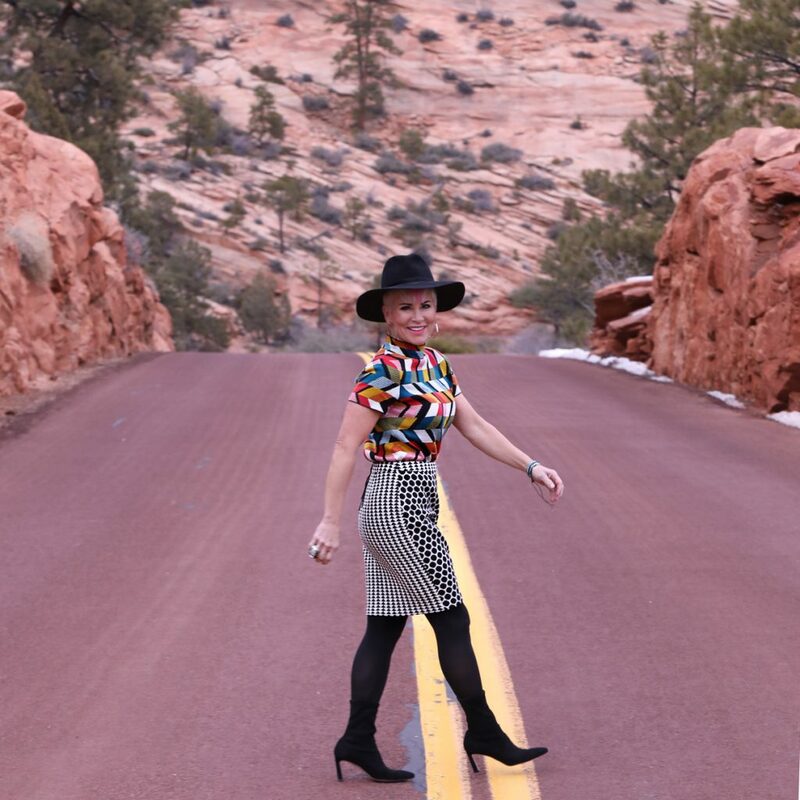 I just thought I would strut my BOLD GRAPHICS and PATTERN MIXING in the middle of the road! It really was such fun! The backdrop was screaming for me!!!!! Have you been there? It is simply STUNNING and so good with this outfit, right??? IT ALL MAKES ME HAPPY! How do you feel about bold graphics, color, and pattern mixing when it comes to fashion? This week I’m going to be appearing on Good Things Utah, talking about some of my favorite trends for this New Year. You can tune in Wednesday at 9am. One of the trends I’ll be talking about, is BOLD GRAPHICS. I know this look isn’t for everyone, but I believe IF you want, there is a way to wear it conservatively. This top I posted a few days ago with some black jeans. The top has a matching skirt, which is another trend….sets. I’ll post that maybe next Sunday so you can get a feel for how ALL THAT BOLDNESS looks together! I personally LOVE all of this funkiness! It’s very ME! And even though I’m short and petite, I honestly don’t care. I feel good in it, and so therefore I believe it works! I wore a less bright lip color with this, and then simple black opaque tights and suede booties. My earrings are square hoops from Dean Davidson and my black felt hat (you’ve seen me where it with EVERYTHING) is from Rag and Bone. Below I’ve linked up a few skirts that I think would look cute with this top. Mine is a vintage Anthro skirt. Someone called me yesterday on the phone for a phone interview. She wants to feature me on her blog. One of her questions was, “What is the one piece of advice you would give women when it comes to fashion”. There were two….make sure your clothes fit properly and alter them if needed, and the other was….IF YOU FEEL GOOD IN SOMETHING IT WILL PROBABLY LOOK GOOD, IF YOU DON’T FEEL GOOD IN IT, DON’T WEAR IT. That’s sort of how I feel about this look. I LOVED it! But for sure there will be someone on Facebook who will let me know it’s too much! It always happens on Facebook! Remember that saying from CHICOS that I loved all throughout their campaigns from 2018……HOW BOLD ARE YOU? Be BOLD and BE CREATIVE when it comes to your fashion……but make sure you feel good doing it! I will be writing and posting a blog some time this week on all of the trends I’ll be showing on TV this week. I have some REALLY GREAT STUFF. I’ll also talk about how to style them AGE APPROPRIATE!!!! Love you friends! I love the way you wear clothes. I bought this beautiful top, based on your post, as a gift for my daughters 34th birthday. She lives outside Seattle and this time of year the weather is dreary. She LOVES the colors and the mock neck style – many thanks !